I thought the evening was a disaster. I got to bed at 10 pm. Set the alarm for midnight. Got up and saw that the clouds were impenetrable at my home near Los Gatos, California. With a sigh I finished packing up my equipment and set out toward the place I had picked days before. It was a private home with an open lot and a great view of the Diablo Mountain Range. The owners had agreed to let me arrive at midnight and remain until about 5 am. BUT when I arrived I couldn’t see the stars or the mountains. Darn. I know that sometimes the mountains east of the San Francisco Bay Area block the low clouds from advancing inland, so I continued on. Sure enough I noticed from the freeway that I could actually see a huge hole in the sky. Astronomers call them “sucker holes” because they sucker you in to thinking its worth setting up equipment. I had to find a way to turn around on the freeway and find an off-freeway road with a decent view. Finding such a place took about 20 minutes, and by the time I arrived, thick clouds had enveloped the eastern sky, but at least I could sometimes make out stars to the north, including the all important Polaris. I set up and aligned my Polarie, and started the automatic timer to take continuous 44 second exposures (2000 ISO) starting at 1:28 AM. I figured, the clouds were sometimes thin enough that I might capture a meteor through them – after all, once in a while I could make out where the bright planet Jupiter was. Time passed and I huddled in my car with what seemed like 20 layers of clothes. I had forgotten my pillow and my sleeping bag and didn’t have my customary thermos of hot chai. The night was cold, breezy and a little damp so the shelter of the car was essential. I slept fitfully. Each time I awoke I saw thick clouds. From 2:16 to 2:23 the clouds seemed like they were going to disappear but they were just teasing me! I slept and shivered some more. I finally found my emergency coat – a tattered old garment I keep in the car which my wife would never willingly let me be seen in public with, and a towel to use as a blanket on my legs. By 3:56 AM the Polarie had tracked Orion high into the sky so little of the foreground was left in the shot. But now the sky was dramatically clearer! Thick clouds threatened in the west but my view of the sky was much better. I moved the camera and reoriented it vertically so I could keep the slope of the hillside in the shot for at least a while. I watched for a bit hearing the familiar sounds of the shutter closing, pausing, opening… A brilliant meteor appeared – it was definitely in my field of view! I was almost ecstatic until I noticed the sound of the shutter opening again and realized the bright one had appeared and left while the camera was between shots. It got away! 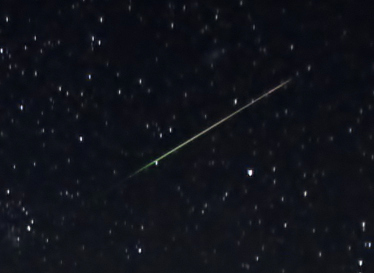 I later discovered that I did catch one little meteor in the vertical mode (see above). From 4:16 to 4:55 I let the rig continue running in the vertical alignment and retreated again to my car for warmth. But now Orion was heading farther and farther south where the fierce light pollution from Fremont and San José was daunting. I aborted the vertical shot and framed up a lovely spreading oak tree that caught my eye. 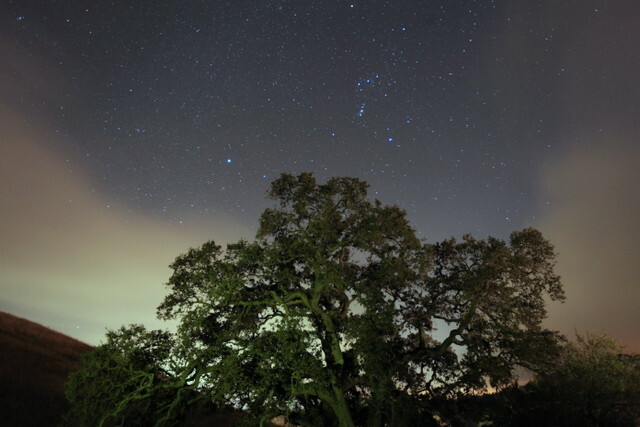 I spent a solid 15 minutes on that oak tree with Orion hanging above it. It was now 5:03 in the morning and I was colder than ever. So I decided I’d reframe the sky shot to avoid the glow of the cities and retreat to the car out of the wind. It was then that I finally really slept and I woke when my alarm went off: 6:02 AM. I was leading a group of hikers to scrub graffiti off the summit of Mission Peak and some were going to meet for breakfast at 6:30 AM. The sky was mostly cloudy again, but I spent a few more minutes framing up my friend the oak, collected my equipment and headed for Denny’s. I spent the rest of the morning and afternoon with a wire brush and paint remover. After my graffiti scrubbing expedition I was exhausted and slept until early Saturday evening. I copied and started looking through my images. I found a very peculiar one almost right away. I wondered what the “squiggle” was. Looking at the frame before the squiggle was still there, though the shape was different. I kept going backward until I found a brilliant flash. BINGO! It seems the meteor appeared at almost exactly the time that my alarm went off. I never saw it with my tired eyes. And there you have it. Almost 5 hours of clouds, a very few meteors and one of the most fascinating phenomenon I’ve ever captured. 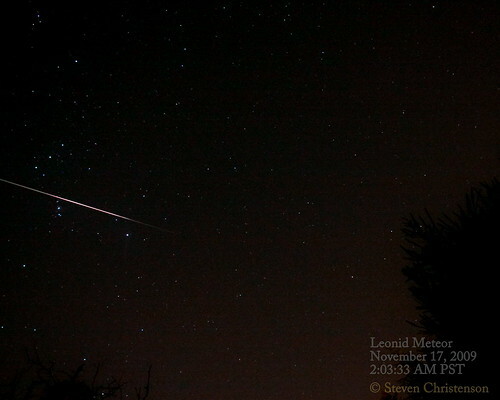 If you’re wondering what settings and tricks to use to capture a meteor, please see my article. 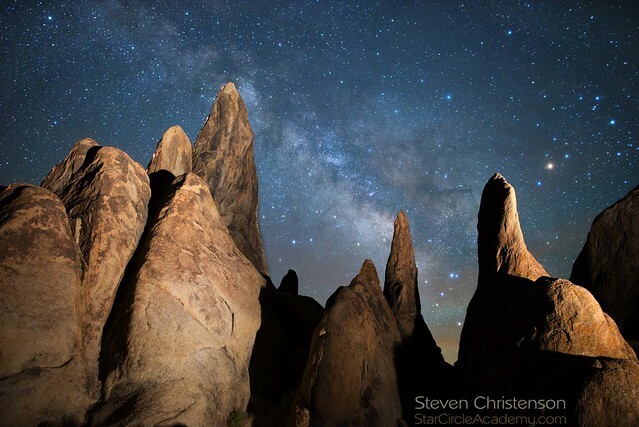 This entry was posted in Astronomical Event, Astrophotography, Equatorial Mount, Image, Photo Tip and tagged meteor, Orion, Orionid, Polarie, timelapse, trail on October 21, 2012 by Steven Christenson. Nothing is quite as exhilarating – to me at least – as watching the sky explode with “falling stars” or meteors as they are more properly called. 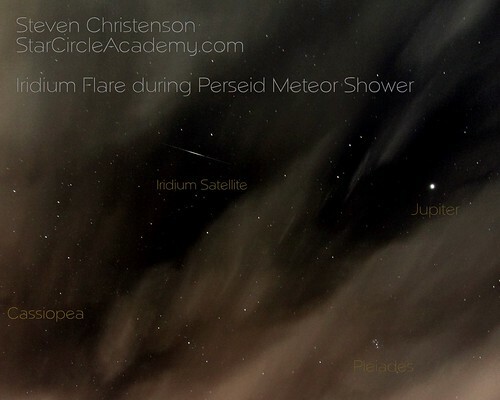 Major meteor showers occur through out the year but the most spectacular and reliable showers are the Perseids in August, the Lyrids in April, and the Geminids in December. 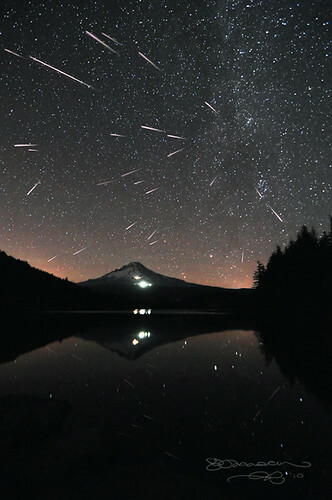 Other notable showers include the unpredictable Leonids in November. In fact, in November there are quite a few minor meteor showers including the Northern and Southern Taurids, and the Aquarids. 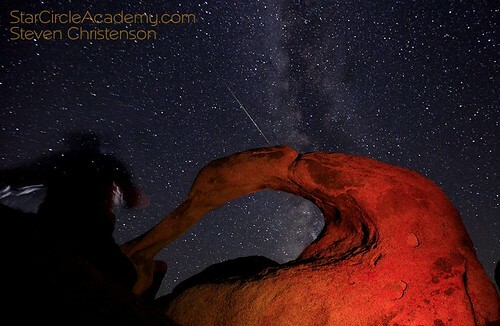 An absolutely brilliant example of well captured meteors can be found in Gary Randall‘s work. Photo 1: by Gary Randall. 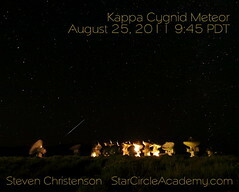 Gary captured 26 meteors over a 3 hour period and realigned them to show their path through the starry sky. 30 second captures f/2.8 ISO 1600 at 11mm on a Nikon D90. 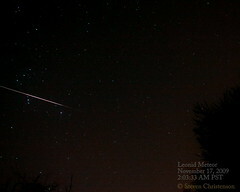 Capturing meteors is much harder than it may seem, however and getting results Like Gary’s is far from a “done deal”. Let’s investigate why and figure out how to successfully capture them. ISO 200, f/4, 30 seconds, Focal length 24mm. 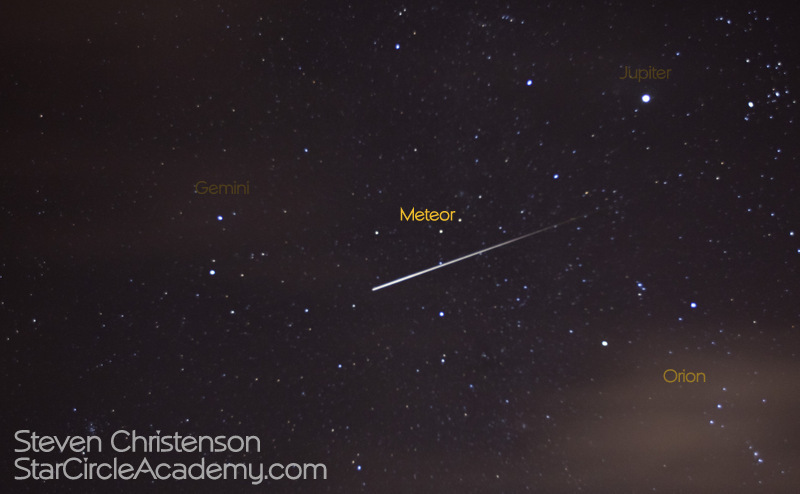 There are two components to meteors that make them difficult to capture. 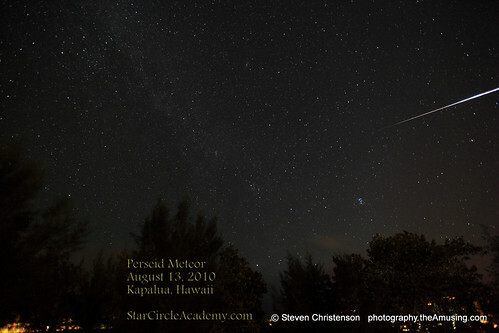 Meteors do not appear in a predictable location in the sky. Indeed all meteors from a particular shower appear to radiate from a single point in the sky, but the meteors streaks may appear anywhere. Meteors are fast. Very fast. And even though they may be bright their speed makes them more difficult to capture because their light does not linger over pixels in the sensor like stars or stationary objects do. Since meteors may appear anywhere in the sky a common strategy is to use the widest possible lens you can and “fire the shotgun” at the sky. This strategy can work however use of a wider angle lens means the sensor area that will be struck by the light from a meteor is diminished. Most important, however is the effective exposure. A short exposure with a wide open aperture at the highest acceptable ISO setting will catch the most meteors against a still sky. In other words ISO 2000, f/1.8, 20-30 seconds at 50mm focal length will capture a streak more effectively. If you can stomach it, ISO 6400 will capture even more – and it may not matter that the image is noisy because you may end up using only the “streak” not the whole frame. It may seem tempting to just expose for say 10 minutes but unless the sky is very dark, that strategy will not work well. 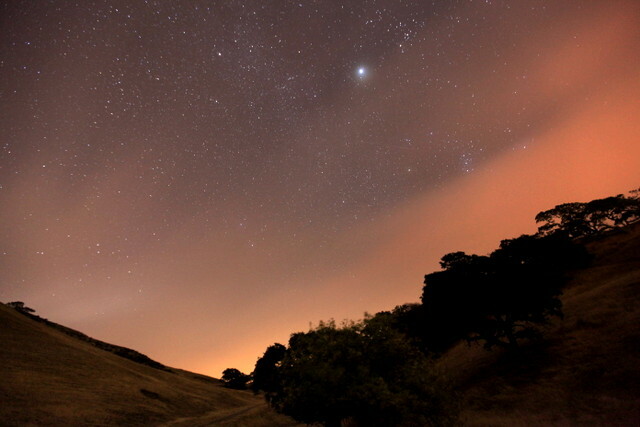 Skyglow will overwhelm the area through which the meteor passes and thus reduce the contrast. The second problem is where to point the camera. If you use a wide angle lens or a fisheye lens you can point it almost anywhere you like. But it is helpful to know where the radiant point is. I like to be sure that the radiant point is in the picture. 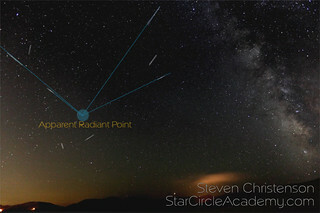 There is a downside to shooting near the radiant point: the closer the meteor is to the radiant point, the more “straight on” the meteor will be and the shorter the trail will be. 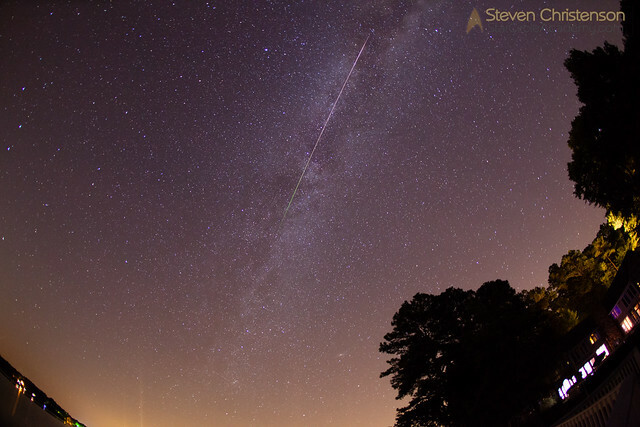 However pointing the camera somewhere away from the radiant point means your chances of catching a meteor go down exponentially – but what you do capture may have a longer streak. 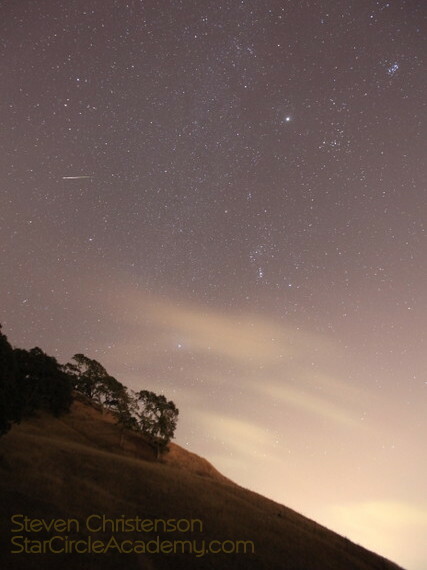 It took me nearly 1200 attempts to get this one meteor in my back yard in San Jose, California. The camera was a Canon 50D at f/5.6 and ISO 1600. It is much noticeably grainier than a more recent capture on my 5D Mk II from Maui. 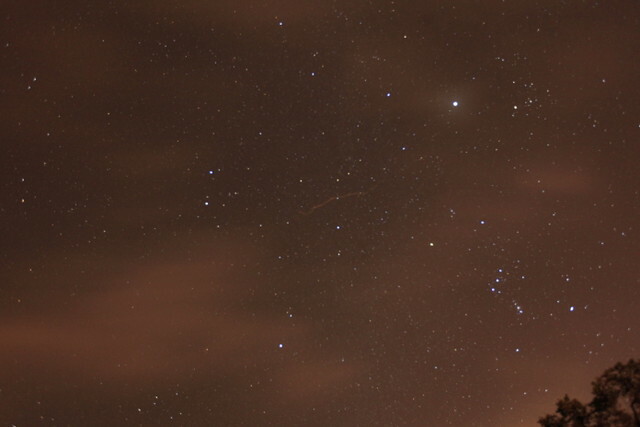 Photo 2: One in 1600 shots that caught (almost all) of a meteor glancing through Orion’s belt. Settings: f/5.6, ISO 1600, 30 seconds, 23mm. Here is an interesting thing to note: the radiant point of the Perseid Meteor is not far from the north celestial pole – that is, where Polaris the north star is. The radiant point of Leo, however is near the celestial equator. Why would that matter? It matters because in 3 hours the Leonid radiant point will have moved a fourth of the way across the sky while the Perseid radiant point will be probably still be in your frame. 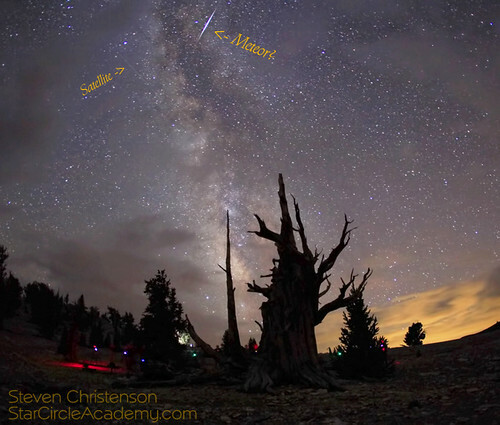 In fact, David Kingham has written an excellent article about how to point your camera specifically for the Perseid Meteor Shower. Back to Gary’s work for a moment. The meteors did not all come at once… no sir. 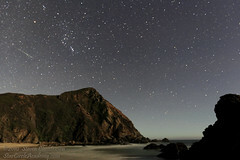 The earth was busy rotating and the meteors shown in the photo were captured over 3 hours time! Had they all occurred at once they might have looked like the Photo 1 above. Placing each meteor where it fell in the frame shows a different story – still compelling, but a bit more chaotic. My thanks to Gary Randall for allowing me to show his excellent work. I heartily suggest you purchase a poster of his work to inspire you. I am doing so! 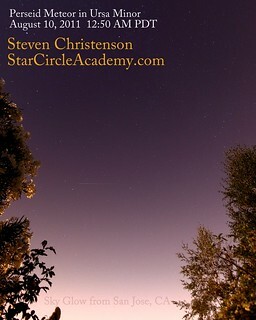 For more information about meteor showers and how to view them, there are many sites on the internet. EarthSky.org is a great resource, for example. 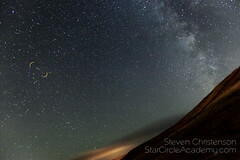 This entry was posted in Astronomical Event, Astrophotography, Photo Tip, Trivia and tagged exposure settings, Gary Randall, Geminid, Kappa Cygnid, Leonid, meteor, meteors, night photography, Orionid, Perseid, shooting stars, showers, stars on November 10, 2010 by Steven Christenson.